today is a big day! why? because it's SuperBowl Sunday or because it is the Lord's Day? hmmm, 'cause it is the Lord's Day, of course ... and by the way, there's a game on too. at the end of the day, i'll probably catch some of it as well. go Colts go. who's with me? this past week has been a SuperBowl this, SuperBowl that! i was pleased to read this article, however, which discussed the teams (Colts vs. Saints) spiritual preparation! today is a big game for both teams, however, both spiritual chaplains help their teams keep things in perspective. "Fr. Gallagher, [chaplain for the Colts], says that paramount in the Colts’ spiritual preparation for the Super Bowl is the realization that when all is said and done football is a game, and win or lose, life is going to continue with its higher challenges and expectations." beautiful! i have always been interested in sports, because they are fun, but now what speaks to me is the theology of sports! you can learn a lot from on person on how well he plays with another. take for example Annunciation of the Lord's classic hockey game, each and every Saturday afternoon. we have young and younger playing together, and we have a great time - because we play as a team, rather than individuals. 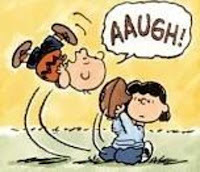 i sometimes get carried away and start yelling, "tackle!" a number of the youth tell me, "Father, you shouldn't be yelling 'tackle' during our pick-up hockey game." hmmm, they are right! i was merely saying it for humour value - but, ah ... taken out of context, some people may get the wrong idea! :) so, yesterday i tried to minimize the use of that word, during the game. i commented on this briefly when we first started playing about a month ago. how people play sports reveal how they live life! are they going to start punching and fighting like some NHL players? hogging the puck, or will they pass and play as a team?! we can apply this to most sports i suspect - football, hockey, ultimate frisbee, etc., where in order to win you must play as a team! charity means to play with your team, not by yourself. that's why i like the Timbit's commercial - it shows us why we like hockey in the first place, a reason that some players may have to revisit! let's get back to football for a second. as i was reading the various comments on this game, i particularly enjoyed what the coach Lombardi had to say. he reminded me of Pier Giorgio Frassati (Saint). wow! i'm not saying that the coach was a saint, but he is considered "the greatest football coach of all time, and is on the short list of history’s greatest coaches, regardless of sport." the more i read, the more i like this guy, and therefore, more to come later. i also happen to fall upon this site. i've been thinking of the theology of sports for a while, and this is just another reason why i should go deeper in that mystery! for as the coach says, "perfection is not attainable, but if we chase perfection we can catch excellence." this is sports. this is the journey of holiness. as Alicia Keys noted, it doesn't mean anything, ... unless i have God in Jesus Christ. ps. 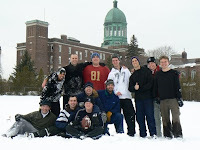 each year before the big game, we had our own big game at the seminary! winner takes all. good times, always! can you spot me? ciao.